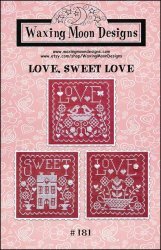 Love Sweet Love [H5587] - $9.00 : Yarn Tree, Your wholesale source for cross stitch supplies. Cross stitch pattern from Waxing Moon Designs. I only have eyes for you! Two love birds have found each other at the bird bath. A butterfly flutters among the flowers blooming. Home "sweet" home! Family & friends gather inside the large two-story home. Flower pots filled with arrangements of flowers decorate the sidewalk leading up to the front door. Can you smell love blooming? A beautiful arrangement of flowers fills a large flower pot. Look closely at the flowers...hearts are blooming. It's a love thing! Stitch count is 69W x 69H.